Thank you so much for the way in which you have managed a new client. This lady was really touched by your sympathetic approach and the compassion shared over the phone. She said that “all your staff that I have spoken to are an asset to your business”. Thanks PCM. As an HR Consultant I used to worry about missing calls when I was in client meetings, but then I discovered Professional Call Minders. They are absolutely brilliant at fending off the unwanted sales calls, dealing with the emergencies and handling client calls professionally. I wouldn’t be without them. We have used Professional Call Minders for the last 5 years to enable us to focus our time where we can add the most value to our business. They help to create the right first impression whilst minimising interruptions to our business, making sure calls are not missed and that the image of the business is enhanced through their professional approach. I have used PCM for many years for help with answering my phone and being at the front end of my business. After previously missing many important calls and losing new leads, now I never miss a call and all of the staff are professional, polite and very helpful to my clients. I have had so many customers telling me that they were really impressed by my secretary! I would certainly recommend PCM to everyone and I couldn’t do it without them! I have been a client of PCM for the past couple of years and I’m extremely pleased with the convenience of the service. They have freed up a huge chunk of my time by handling all our calls, dealing with bookings and even taking payments. They are incredibly professional, friendly and responsible – one of the best choices I made for my business and I wouldn’t hesitate to recommend them to anyone. 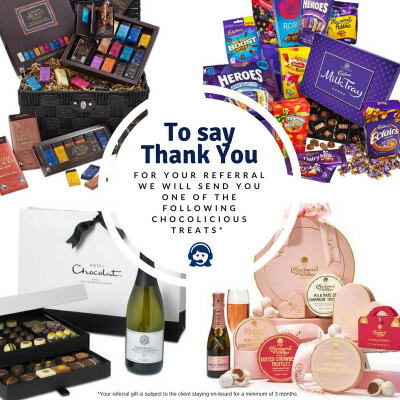 If you know someone that could benefit from telephone answering, let us know and we’ll say “thank you” and send you a yummy gift.